Two elephants have helped prevent a truck from overturning in Louisiana. When authorities responded to an emergency call about an 18-wheel vehicle stuck in a muddy lay-by, they found the elephants hard at work. 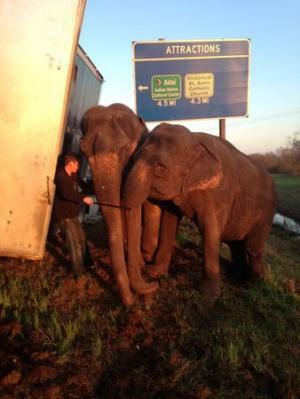 The Natchitoches Parish Sheriff’s Office said the truck had been hauling three elephants from New Orleans to Dallas when it got into trouble. Officials were “astounded” by what they saw, a spokesman said. The truck became stuck when it pulled off the highway and onto a lay-by near Powhatan, Louisiana, shortly after 07:00 local time on March 24. “When deputies arrived on scene, they were astounded to find two elephants keeping the eighteen wheeler from overturning,” the sheriff’s office said in a statement. As the truck began to lean towards a ditch, the owner led two of the elephants out of the trailer and corralled them into preventing the truck from falling further. Recent rains have caused the ground surrounding the highway to become soft, the sheriff’s office said. Eventually a tow-truck pulled the vehicle to safety, and the elephants were able to rest. It is not clear who owns the elephants or the truck.